UCL looks set to play a central role in three new space missions designed to unlock the secrets of the Sun, search for dark matter, and seek out planets that could harbour life. The UK Space Agency has just awarded £3.65m to help scientists prepare for the missions, Solar Orbiter, Euclid, and PLATO, and UCL is involved in all of them. The missions are part of ESA's Cosmic Vision programme and have been selected from more than 50 original ideas to go forward for detailed technical and cost assessments. Solar Orbiter is designed to travel closer to our own star than any previous Sun-watching mission. It would use an elliptical orbit to take it up to the Sun's higher latitudes to image, for the first time ever, the polar regions of our star. This special path would also allow Solar Orbiter to keep pace with the Sun's rotation so that it could track specific features below it for several weeks at a time. 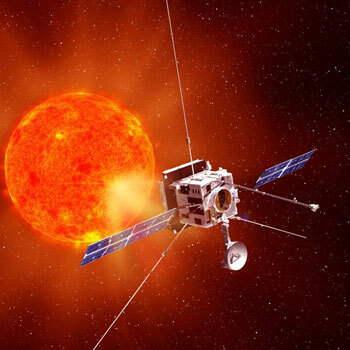 As it travels around the Sun, bombarded by the solar wind, Solar Orbiter will carry out in-depth studies of the connections between the Sun and space and could provide major breakthroughs in our understanding of how the inner Solar System works and is driven by solar activity. The unique design of the spacecraft would allow it to withstand the scorching heat on the surface facing the Sun and the cold of space on the opposite surface which would always remain in shadow. Professor Chris Owen from UCL's Mullard Space Science Laboratory (MSSL) is the Principal Investigator for the proposed Solar Wind Analyser, one of the 10 possible instruments which the spacecraft would carry to study the Sun. Euclid would address key questions relevant to fundamental physics and cosmology - namely, the nature of the mysterious dark energy and dark matter. Current theory suggests that these substances dominate the ordinary matter of stars and planets. In particular, dark energy has been proposed to explain the observation made by the Hubble Space telescope that - contrary to expectations - the expansion of the Universe seems to be faster now than it was billions of years ago. Euclid would effectively look back in time about 10 billion years, covering the period over which dark energy seems to have accelerated the expansion of the Universe, and map the distribution of galaxies to reveal the underlying 'dark' architecture of the cosmos. MSSL's Professor Mark Cropper is the UK Principal Investigator for Euclid and, if selected for development, his colleagues at UCL Space & Climate Physics would join a team drawn from five other UK universities to develop instruments and data processing/analysis activities. PLATO (Planetary Transits and Oscillations of Stars) is designed to seek out planets far beyond our solar system, orbiting distant stars in our galaxy, the Milky Way. It would be powerful enough to detect rocky planets in the habitable zone - the region around a star where liquid water can exist: in other words, to find new earths if they are out there. Using a suite of space telescopes on a single spacecraft, PLATO would detect these planets as they pass in front of their stars, blocking the star light and causing a brief and tiny dimming. The mission would focus on solar systems close enough to be scanned for bio-signatures, or signs of life by later missions and ground-based telescopes. Space scientists from UCL are involved in the design of PLATO, along with colleagues from five other UK institutions. In June 2011, ESA will decide which two of the three missions to build and launch between 2017 and 2020. For more information about MSSL or Cosmic Vision, follow the links above. Image: A computer-generated image of the Solar Orbiter (credit: ESA). As the UK's largest university-based space science research group, MSSL delivers a cutting-edge science programme, underpinned by a capability in space science instrumentation, systems engineering and project management, and is also committed to a broad outreach programme.